Home News & Opinion Can Dan Quinn do for the Atlanta Falcons what Mike Smith couldn’t? 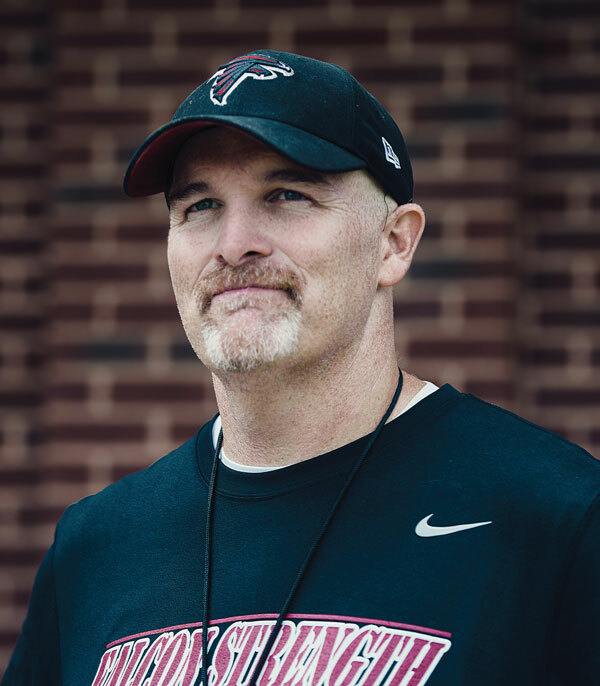 Can Dan Quinn do for the Atlanta Falcons what Mike Smith couldn’t? Dan Quinn’s first regular season game as Falcons head coach is Monday, September 14, against the Eagles. Moments after the Falcons wrapped up day one of training camp, Dan Quinn faced his morning’s biggest challenge: parting the sea of reporters and cameras on hand to hear the rookie head coach’s thoughts. After praising one immovable cameraman for setting a “great block,” Quinn found his chair and smiled with the friendly intensity of a coach who hasn’t been around long enough to hate the media. Quinn stayed faithfully on message—no, the Falcons are not rebuilding; yes, the team will outhit its opponents—and compared the first day of training camp to Christmas morning as a child, when he finally got to see what his toys could do. Quinn is just 44, and with his goatee, shaved head, and focused stare, he gives off the vibe of a career bouncer. His hiring comes at a crucial time for the Falcons, now just two years away from relocating to their new home—a $1.5 billion stadium whose bill will be paid partially by selling personal seat licenses, some of which cost as much as $45,000. But nobody wants to sell PSLs on the backs of a losing franchise, and that’s what Falcons owner Arthur Blank was faced with. After the team’s 6–10 finish last season, on the heels of a 4–12 record the year before, Blank fired Coach Mike Smith, calling it the “hardest decision” he’d ever made. Quinn, not coincidentally, is something of a defensive genius. As defensive coordinator for the Seattle Seahawks, he oversaw the top-rated defense in the NFL the past two seasons. The team won the Super Bowl in 2014, and came within a yard of repeating this year. Given the Falcons’ travails, it’s also not a coincidence that the word heard more than any other at camp was energy. Running back Devonta Freeman spoke of the energy Quinn brought. Wide receiver Roddy White noted the speed of practice. 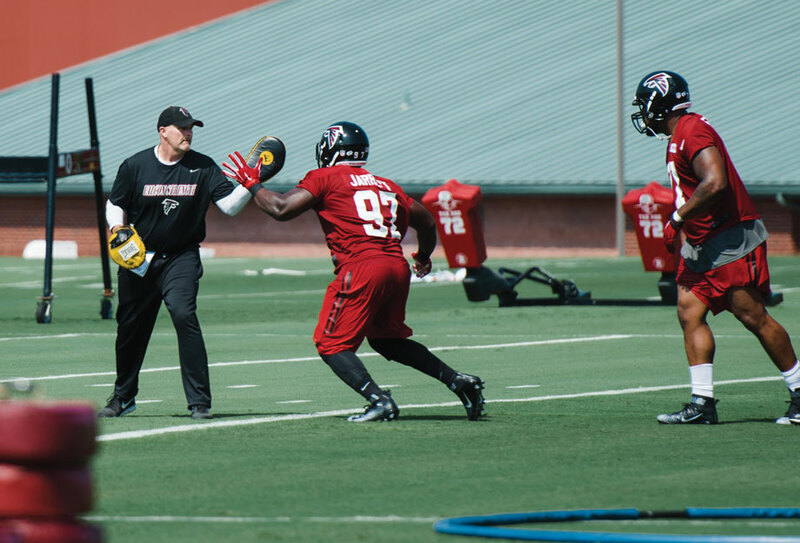 Rookie linebacker Vic Beasley was impressed by how hands-on (literally) the coach had been. A few hundred fans were in attendance. They saw Freeman, who at 5 foot 8 and 206 pounds would be an amazing physical specimen in any other environment but looked almost worryingly fragile surrounded by his behemoth teammates. They saw vets competing against rookies, some of whom we’ll never hear from again. They saw team camera operators on hydraulic lifts take aerial shots of formations, and employ a complex pulley system to fetch themselves water bottles to ward off sunstroke. In contrast to the sometimes somnambulant Georgia Dome, loud music blasted throughout practice, a trademark of the new coach. The playlist ranged from Jay Z’s “Who Gon Stop Me” and L’il Wayne’s “Right Above It” to Kenny Chesney’s “Beer in Mexico” and the Raconteurs’ “Salute Your Solution.” It’s hard to overstate the music, because the volume made it impossible to overhear anything the players or coaches were saying, and because it did, undeniably, add energy to what might otherwise seem boring and workaday. Quinn, who’s tweeted memorials to Tupac Shakur, said he’s excited to coach in the hip-hop capital of America. Hip-hop is about competition and hustle, he said. Quinn wants that same attitude on his team.